Modern industries depend on the manipulation of heavy metal and alloys: Metal is needed to build the tools and transportation necessary for day-to-day business. For example, we build cranes, cars, skyscrapers, robots, and suspension bridges and much, much more out of precisely formed metal components. The reason is simple: Metals are extremely strong and durable, so they are the logical choice for most things that need to be especially big, especially sturdy, or both. But how exactly do you get metal in the specific shapes and sizes you need them in? The answer is quite simple: You cut it. Let’s break these down and discover how each is used to cut metal. 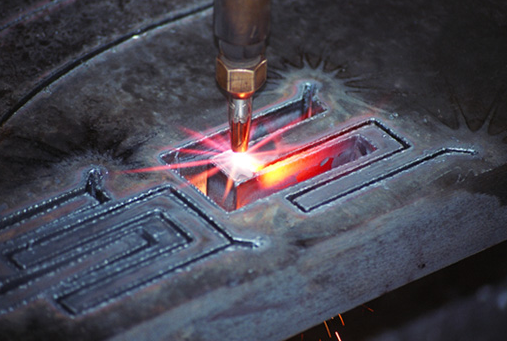 Plasma cutting is a process that is used to cut steel and other metals of different thicknesses using a plasma torch. In this process, an inert gas (in some units, compressed air) is blown at high speed out of a nozzle; at the same time an electrical arc is formed through that gas from the nozzle to the surface being cut, turning some of that gas to plasma. The plasma is sufficiently hot enough to melt the metal being cut and moves sufficiently fast enough to blow molten metal away from the cut. Below is a really cool example of how a plasma cutter is used. In Oxy Fuel cutting, a torch is used to heat metal to its kindling temperature. A stream of oxygen is then trained on the metal, burning it into a metal oxide that flows out of the kerf as slag.Sometimes called a “Gas Axe”. An Oxy Fuel cutting torch has a 60- or 90-degree angled head with orifices placed around a central jet. The outer jets are for preheat flames of oxygen and acetylene. The central jet carries only oxygen for cutting. The use of several preheating flames rather than a single flame makes it possible to change the direction of the cut as desired without changing the position of the nozzle or the angle which the torch makes with the direction of the cut, as well as giving a better preheat balance. A water jet is a tool used in machine shops to cut metal parts with a (very) high-pressure stream of water. As amazing as it sounds, if you get water flowing fast enough it can actually cut metal. Think of a water jet as something with about 30 times the pressure of the power washer wand at your local car wash. Power washing at car washes is an everyday example of a dirt film being “cut” off the body, wheels and tires of an automobile. 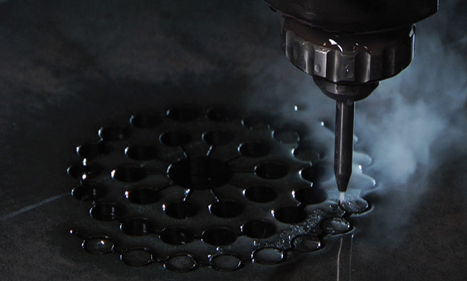 The key to cutting metal with water is to keep the spray coherent. Water jets are able to cut because the spray is channeled through a very narrow jeweled nozzle at a very high pressure to keep the spray coherent. Unlike metal cutters, a water jet never gets dull and it cannot overheat. Laser cutting works by directing the output of a high-power laser most commonly through optics. The laser optics and CNC (computer numerical control) are used to direct the material or the laser beam generated. 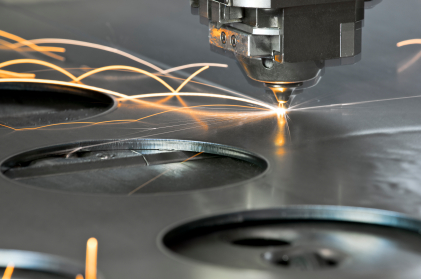 A typical commercial laser for cutting materials would involve a motion control system to follow a CNC or G-code of the pattern to be cut onto the material. The focused laser beam directed at the material, which then either melts, burns, vaporizes away, or is blown away by a jet of gas,leaving an edge with a high-quality surface finish. Industrial laser cutters are used to cut flat-sheet material as well as structural and piping materials. Cutting with shears is a much less accurate way of cutting metal (usually sheet metal) and us usually reserved for cutting down large sheet of metal into smaller sheets of metal much like in the way you might cut a piece of paper down with a pair of scissors. Imagine that but on a much larger scale. There are several different kinds of shear cutting tools ranging from power shears to hand-held shears. Once again, the size of your project will determine what kind of metal shear is best suited for you needs. 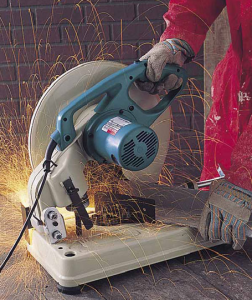 An abrasive saw, also known as a cut-off saw or metal chop saw, is a power tool which is typically used to cut hard materials, such as metals. 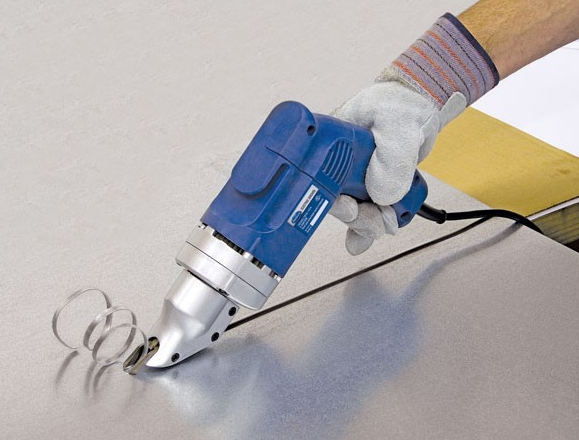 The cutting action is performed by an abrasive disc, similar to a thin grinding wheel. Technically speaking this is not a saw, as it does not use regularly shaped edges (teeth) for cutting. The abrasive saw generally has a built-in vise or other clamping arrangement, and has the cutting wheel and motor mounted on a pivoting arm attached to a fixed base plate. 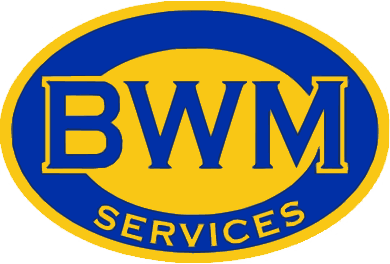 Here at BWM Services, we provide all of the above methods of metal cutting and much more. If you have any questions about our services, please feel free to contact us! This entry was posted in Metal Cutting, Metal Fabrication and tagged Laser Cutting, Metal Saw, Metal Shearing, Oxy Fuel Cutting, Plasma Cutting, Water Jet Cutting. Bookmark the permalink.